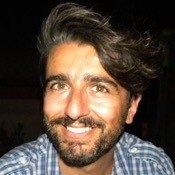 Traveler Review for Private Tour in Lecce, Apulia, Italy by Tour Guide Gianluca G.
Gianluca was an engaging and interesting guide and happy to talk about himself and life in Puglia/Italy. We enjoyed our tour very much. Thank you Gianluca. TOUR GUIDE RESPONSE: Thank you Jenny! I'm so glad you enjoyed very much our tour of Lecce. I had a nice time too, with you and your group. You're very nice people and great travelers. A big hug to you all and...greetings from Puglia!